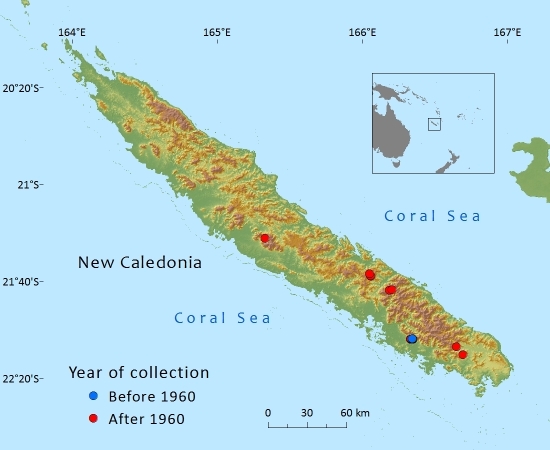 Endemic to New Caledonia on the main island of Grand Terre where it has a very narrow distribution and is threatened by open-cast mining and fire. Tree to 20m tall; dbh to 60cm. Bark fissured and with fibrous exfoliating strips, brown or reddish brown. 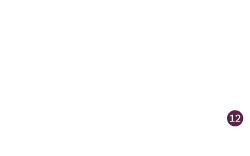 Branches spreading to form a rounded or irregular crown. Leaves linear-lanceolate, 5–10 x 5–10cm, straight or sometimes falcate, gradually tapering to a petiole at base, leathery, apex acute or obtuse, grey-green or dark green above, lustrous green. Midrib prominent on both sides. Stomata small, forming many intermittent lines in two bands on upper surface. Male pollen-cones axillary, solitary, sessile, subtended by triangular, bud-scales, 15–25 x 2.5–3.5mm. Female seed-cones axillary, solitary on a 8–17mm long peduncles; receptacles swelling 8 x 4–5mm long, red and succulent, made up of 3–4 bracts subtended by two spreading bracts. This species is only known from five high peaks in four locations on Grande Terre (1,000 to 1,400m ). The main localities are at Mont Mou, Me Maoya, Mt. Nakada and Mont Nékandi. The extent of occurrence is estimated to be about 1,900km² with an area of occupancy of about 20km². Records from low altitude areas such as Koumac (Valle de la Rade) and the Ile de Pins represent atypical locations and need further investigation. Small subpopulations of probably less than 100 mature trees in each location. Restricted to high altitude montane tropical rainforest, with Araucaria (on Mont Mou) and many other different angiosperms. Limited to four widely disjunct locations near the summits of mountains. One population occurs above a mine and most threats come from mining. The area of occupancy (20km²) is well within the threshold of 500km². 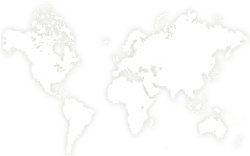 The extent of occurrence of 1,879km² is also well below the 5,000km² threshold. There is also continuing decline in quality of the habitat and number of mature individuals. Each subpopulation is quite small with less than 100 mature individuals in each, hence the overall population size is well under the 2,500 threshold for Endangered. The most direct threat comes from open cast mining and its associated activities. Fires are also a significant threat. Predicted increases in average annual temperature, changes in rainfall patterns and other manifestations of climate change could decrease the area of suitable habitat for this species. Only one of the locations (Mont Mou) is a within a protected area. Mining is not prohibited in this area. Farjon, A., Bachman, S., Gardner, M.F., Luscombe, D., Reynolds, C. and Thomas, P. (2006). Conservation Assessments of Data Deficient (DD) Conifers Using Herbarium and Geographical Information System (GIS) data. RBG Kew, Bedgebury Pinetum, RBGE, Edinburgh. Gray, N.E. (1955). 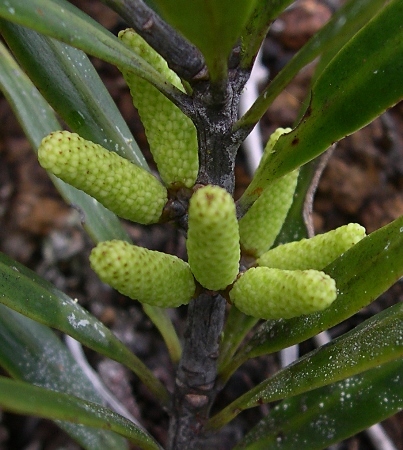 A Taxonomic revision of Podocarpus IX. 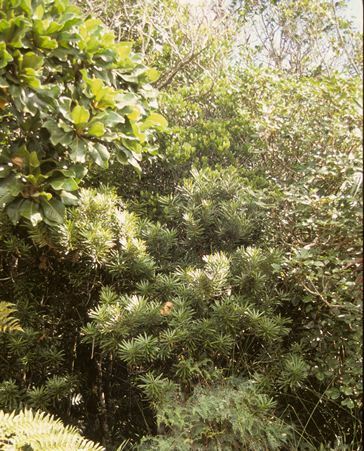 The south Pacific Species of Section Eupodocarpus, Subsection F. Journal of the Arnold Arboretum 36:199-206. Thomas, P. (2010). 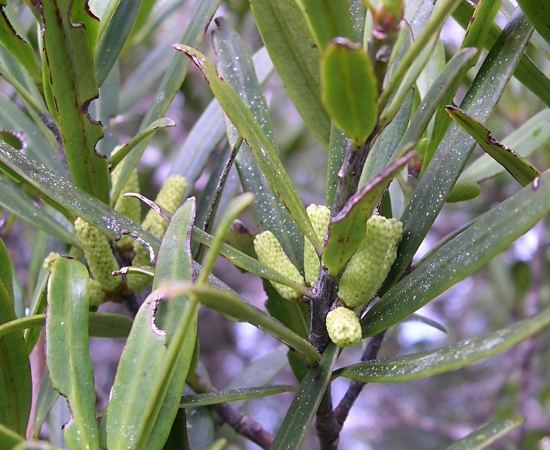 Podocarpus longefoliolatus. In: IUCN 2012. IUCN Red List of Threatened Species. Version 2012.1. www.iucnredlist.org. Downloaded on 29 June 2012. P.I.Thomas ,T.Jaffré ,J.Munzinger ,and P.P.Lowry , 2015. Podocarpus longifoliolatus, from the website, Threatened Conifers of The World (http://threatenedconifers.rbge.org.uk/taxa/details/782).